Before K was born, I chose to ignore any really messy craft. 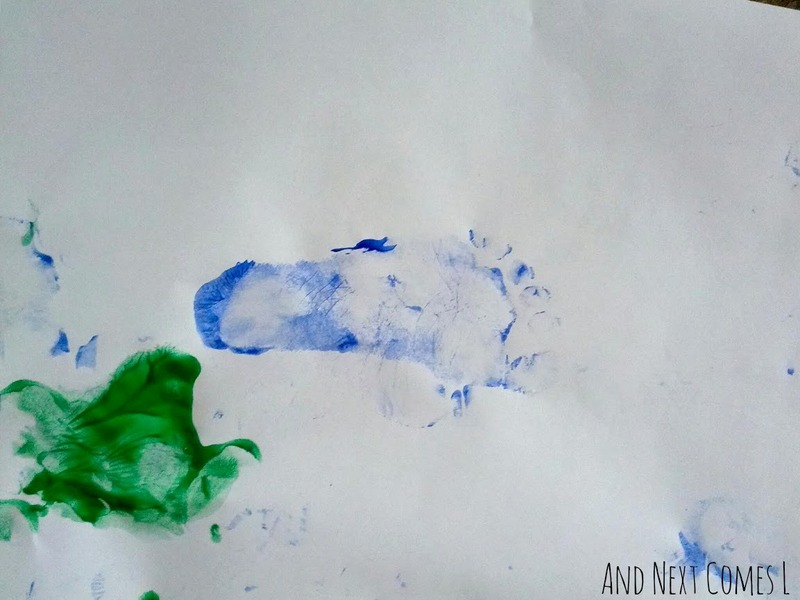 I hate cleaning at the best of times, so why would I chose to do a craft with my toddler that would result in more cleanup?! I also have light carpet everywhere and I did in my old house too. So messy toddler + light carpet = disaster. In the early weeks of my pregnancy with K, I became a lot more lax, letting J explore the world around him more freely. It was also at this point that I fell in love with sensory play. 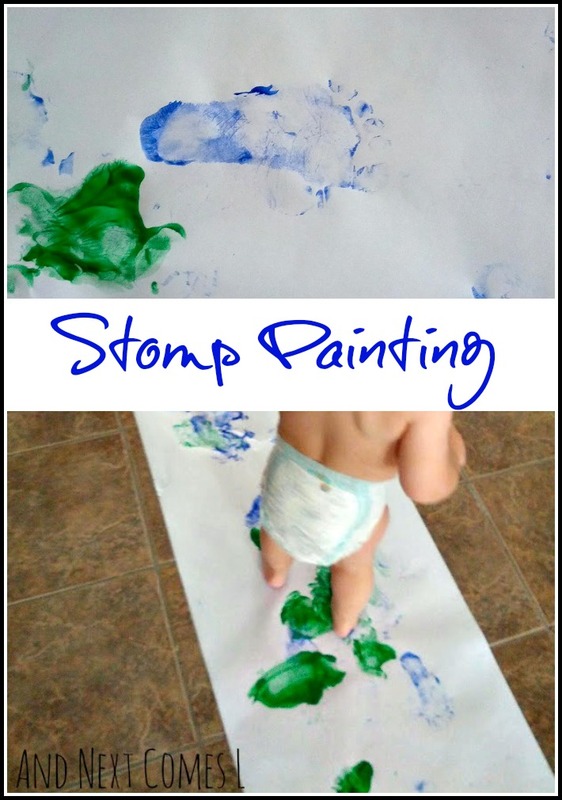 Shortly after K was born, I came across the idea of stomp painting. I don't remember where I read about it, but it sounded like a lot of fun. Messy fun, but fun regardless. So I put it off for months and months and months. Well, it has been a long winter and I was running out of ideas to keep the boys entertained. I needed something new and exciting. Something that would be appropriate for both a toddler and a preschooler. J loves painting and K has only painted a few times as he usually ends up trying to eat the paint. Seriously, he will eat anything that looks even remotely like food. So I needed an alternative. I decided it was finally time to try out some stomp painting! 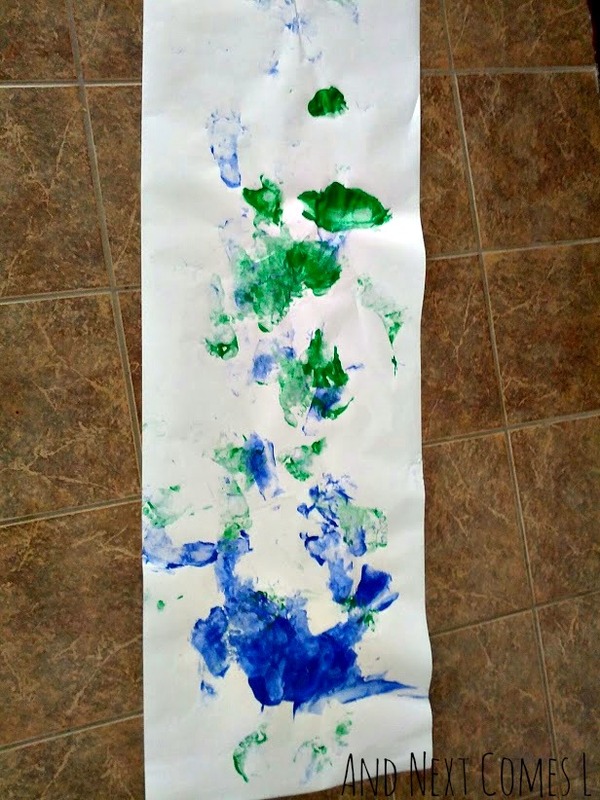 Tempera paint - I kept it simple by using only two colors: blue and green. I chose to set up the paint area on the kitchen floor where I have ceramic tile floor. This activity would be awesome to do outside on the grass or deck too, but that cannot happen here for a couple of more months. Like I said, long winter. I put some gobs of paint in random spots on the paper. I told the boys that the craft was ready if they wanted to participate. J did not want to. He was too busy playing with something else. Probably his calculator. I can't really remember. K, on the other hand, was excited. I stripped him down to just a diaper. I even put him in a disposable since I didn't want to be washing paint off any of his cute cloth diapers. 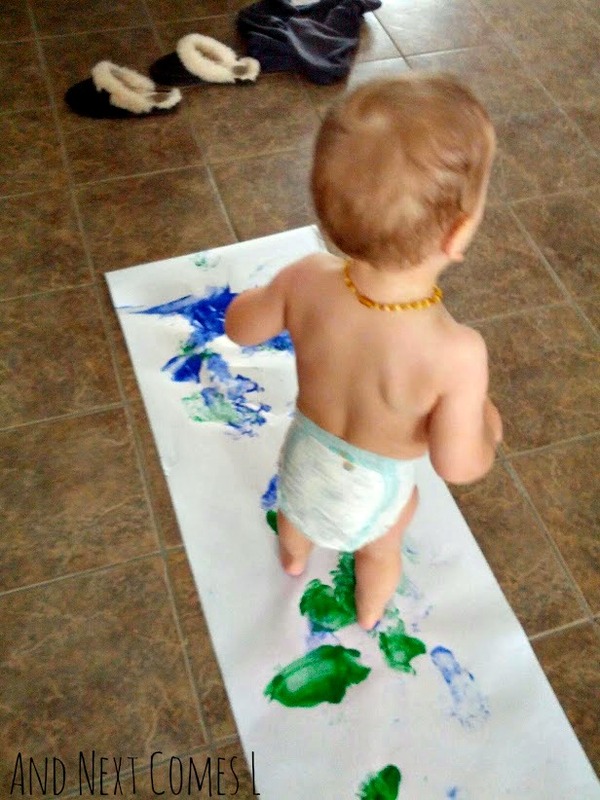 Then I set him on the paper and he started walking around in the paint. K was loving it! I even had him dancing at one point. And if you have ever seen him dance, it's super cute. His dance moves are all in the hips. After about five minutes of "painting," he walked off and tried to climb a chair. That was it. And it wasn't nearly as messy as I had anticipated! Although it doesn't look like much, there was an amazing footprint. Now I had this huge painting that was colorful and a good memory, but not necessarily worth keeping. I left it to dry on the dining room table while I tried to figure out what to do with it. Obviously, I took a picture so I had that as a keepsake, but I wanted to do something else with it. When I was filling out the "I Like Books" for the boys that night, I had the perfect idea! There are always pages in the book for the kids to draw on. K still only scribbles so his sketch pages are usually left blank. 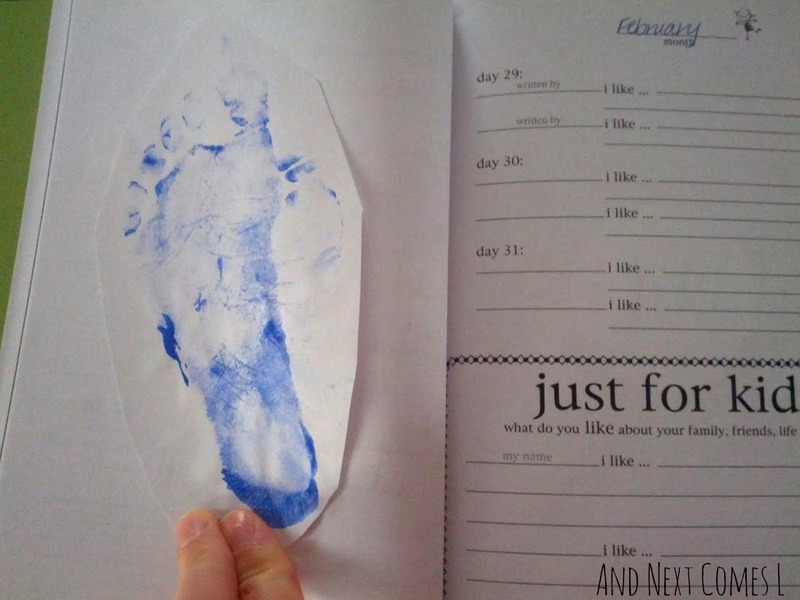 That's why I decided to cut out the footprint and glue it into his book. It looks wonderful in there! Sure it only lasted five minutes, but K had a blast and I ended up with a cute momento. Great idea!! You could do this on a drop cloth with hands and feet then cut out a section , staple it over a wood frame and hang it in their rooms!! I love putting it in his book for a forever treasure!! Very cool, great post! Ooooh, that is a great idea too, Lisha!